Based on the DC Comics character of the same name, Aquaman is a 5 reel, 243 ways to win slot game from Playtech. This superhero-themed game comes with plenty of extras including streak respins, respins with locked wilds and a free spins round with wild multipliers and upgraded symbols. You’ll also have a shot at landing a progressive jackpot prize. Play on all devices from between 25p and £500 per spin. The design in this Aquaman is comic book style and impressively done. With the underwater city of Atlantis in the background, you’ll see A to 10 royal values plus a selection of aquatic monster baddies. The Queen of Atlantis, Mera appears in the base game only and offers payouts of up to 14 times your stake. Best of all is Aquaman himself who’ll get you 3, 6 or 20 times your stake if you land 3, 4 or 5 on adjacent reels. The trident is the wild. Like most of Playtech’s superhero-themed slot games, there’s a good range of extras on offer in Aquaman. Trident Wild Respins feature - these are triggered if a fully stacked Aquaman symbol fills the whole of reel 2. On the respin, Aquaman throws his trident onto the reels to turn 3 adjacent symbols into locked wilds. The respins continue until a new winning combination is created. Ocean Rush Respins feature - you’ll need to see a fully stacked Mera on reel 4 to trigger this round. 1 symbol is picked at random - when this hits, it locks in place. The respins keep on coming as long as a new matching symbol joins the cluster. If you’re lucky enough to land Aquaman on reel 2 and Mera on reel 4 on the same spin, then the 2 respin features are combined to potentially spectacular effect. Atlantis Free Games feature - landing 3, 4 or 5 scatters on the same spin awards 8, 12 or 16 free spins. Look out for the golden Aquaman symbol here. Collect these to upgrade the sea monster symbols into the top paying Aquaman. The more you collect, the more symbols transform. Look out too for the wild multipliers. When these form part of a winning line, they can double, treble or even quadruple payouts. Landing 2 or more scatters on the same free spin delivers a retrigger – there are no limits to how many extra free spins you can win. Jackpot Game feature - Aquaman is part of the DC Super Heroes Jackpot network. The jackpot round can strike at random on any spin. Once active, pick from the grid to reveal colours which in turn deliver the Mini, Minor, Major or Grand Jackpot. Aquaman isn’t one of the DC universe’s best-known characters. Expect that to change once the Aquaman movie hits the screen later this year. This comic book adaptation is a good one. The design is as classy as you’d expect and there a good range of bonus features on offer. The respins and the free spins all come with added extras to live up the play. 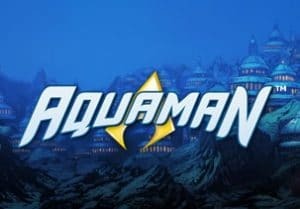 If you’re a fan of this superhero franchise or just fancy a well-designed and feature packed slot game, then dive on in with Aquaman – it can reward you with 2,000 times your stake on each free spin involving a 4x wild multiplier. If you like superheroes, I recommend you play Justice League which is based on the official movie.